Carolyn Thorne Long, loving wife, sister, mother, grandmother, aunt, and mother-in-law died peacefully at her home on Wednesday, November 14, 2018, at age 79. Carolyn was born on August 7, 1939 in Washington, DC to John William and Ruth (Behrens) Thorne. She grew up in Arlington, VA and met her future husband Danny Long, to whom she was married to for 57 loving years. She and her family relocated to Topeka in 1982. 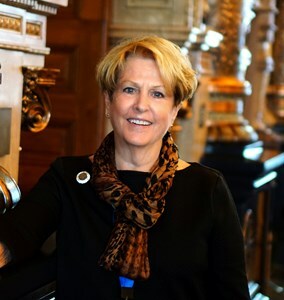 She was an executive assistant in numerous 501 schools and worked for over 12 years in the Kansas Statehouse serving several different Senators and committees. She loved life and cherished her family. She enjoyed camping, traveling, the Washington Redskins, her dogs, and supporting the activities of her children and grandchildren. She was preceded in death by her father and mother, brother, Johnnie, In-Laws Ormond, Margaret, Larry Long and one niece, Erin Long. She is survived by her husband Danny, sister, Della (Tom) Smith, Children Tammy Shaw, Scott, Brett (Shannon), and Stephanie (Troy) Wilson. Also surviving are her four grandchildren, Troy, Sydney, Emily, Owen, her three nieces, Jennifer, Amanda, and Kelly, and numerous cousins. The family would like to thank everyone for their love and support during her difficult journey. A Celebration of Carolyn's Life will be held on Saturday, December 8, 2018 from 1:00 p.m.- 4:00 p.m. at the Grace Episcopal Cathedral Parrish Hall, 701 SW 8th Ave., Topeka, Kansas 66612. In lieu of flowers, memorial donations can be made to the Helping Hands Humane Society. Add your memories to the guest book of Carolyn Long. I’m am so sorry to hear about your loss. Your mother was a very special women. My parents enjoyed her company at the ball park. Find some peace and comfort in knowing that she is finally at home with God. May He bless and comfort you. Danny - I am so sorry for your loss. I pray your family with help you and each other at this most difficult time. I am sorry to hear of Carolyn's passing. I met Carolyn while working at the Kansas Legislature. She was always upbeat and so much fun to be around.